How about a sticky link for all the dyno plots? Take the conversation to different threads and just keep this link for a list of mods, test conditions, and dynoplots? 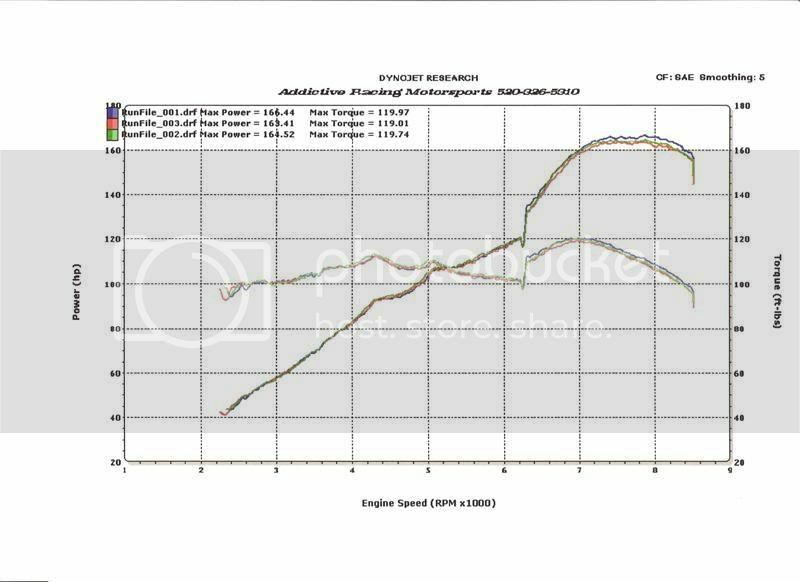 Here is my baseline dynoplot with stock intake, exhaust, and lighter flywheel on 2005 Elise with LSD. 90F low humidity. Last edited by fzust; 05-05-2006 at 12:50 PM. and 10 min after fzust on the same dyno, here's mine. 2005 Elise, all stock except QuickSilver exhaust, MWR Light Weight flywheel, LSD. Last edited by milcher; 05-07-2006 at 01:20 AM. My 2006 Exige with Larini SE exhaust and Reverie intake. Finally got it printed, the run was on Friday, correction factor was 1.05. No modifications except the header, no catalytic converter. Muffler was Larini. Peak hp was 177.06, best torque 126.38. Air fuel ratio was LEAN, under investigation. The car is a 2006 Exige. Last edited by MikeW; 06-12-2006 at 01:56 PM. I scanned this in for Dave, 2005 Elise with the lower switchover. Before and After FF Street Headers and Cat. 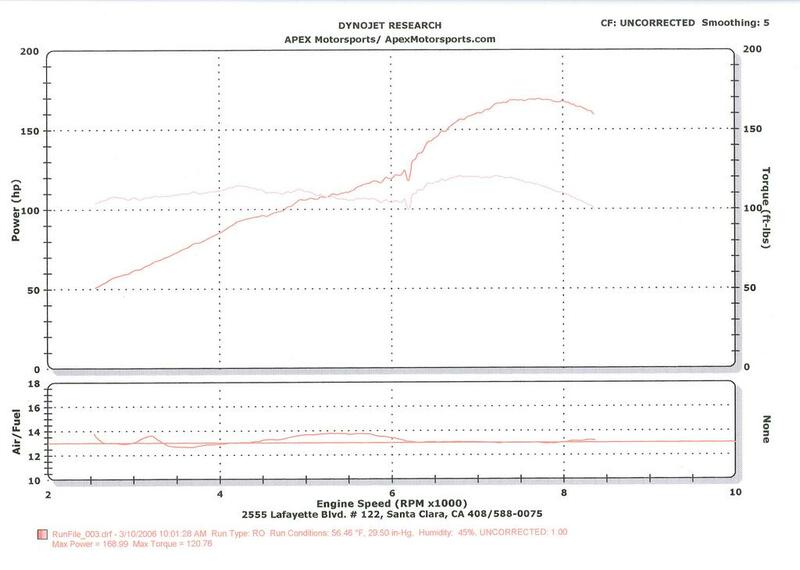 Both graphs also include Larini exhaust and Reverie intake. It was the same day on both dyno runs. I only drove about 10 mins after the headers were installed. I dyno tested it a month later too, and the gains were the same. Last edited by raygr; 10-05-2006 at 07:55 PM. Here's mine with just a QS. Remember folks this is just a dumping ground for dyno plots. Please take the conversations to a new thread. Baseline + FF275 on Pump 91 and Race 100 Gas. Tried to start the turbo plots at 2000rpm, though there is a couple hundred RPM difference in the two. The baseline was done previously on a different dynojet where I started at 1000rpm. Bottomline. More power and torque after 2500rpm than stock. Any comments? Please start a new thread, this is just for dyno posting! And on a half accurate dynapack actually tops out at a less impressive 340bhp. Last edited by chiuman; 10-06-2006 at 08:55 PM. Here's my Exige, stock, just after the 1k service. It is the third, and best, of three runs. Last edited by pwe; 04-19-2007 at 06:29 PM. Reason: Fix link to image. Baseline, about 90 degrees out today (it was HOT), and maybe 30% humidity. Looks like my Elise is about on par with most of the others.